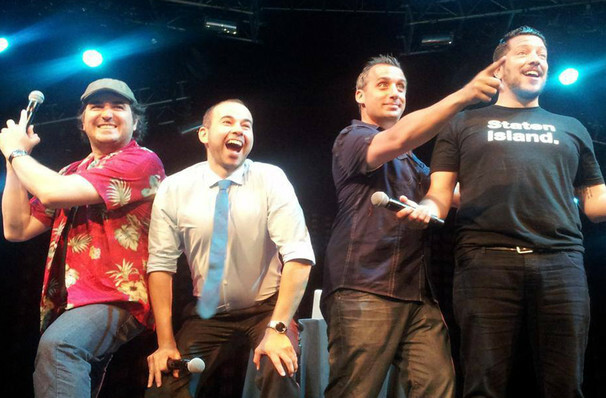 Why See Cast Of Impractical Jokers & The Tenderloins? The Tenderloins formed in 1999. This comedy and sketch comedy troupe, made up of Joe Gatto, James Murray, Brian Quinn and Sal Vulcano, honed their act on stages nationwide until they hit it big with their videos on Youtube. IN 2011 TruTV gave the group their own series named Impractical Jokers. A novel twist on the candid camera format, the show features one of the stars interacting with the public, being fed his lines by the other three via earpiece. The Impractical Jokers live show is a mix of sketch comedy, behind the scenes insights from the TV series and plenty of audience participation (you have been warned). The Tenderloins have a brand new live show for this year called Santiago Sent Us, packed full of fresh, side-splitting new material! Sound good to you? Share this page on social media and let your friends know about Cast Of Impractical Jokers & The Tenderloins at Comerica Theatre. Please note: The term Comerica Theatre and/or Cast Of Impractical Jokers & The Tenderloins as well as all associated graphics, logos, and/or other trademarks, tradenames or copyrights are the property of the Comerica Theatre and/or Cast Of Impractical Jokers & The Tenderloins and are used herein for factual descriptive purposes only. We are in no way associated with or authorized by the Comerica Theatre and/or Cast Of Impractical Jokers & The Tenderloins and neither that entity nor any of its affiliates have licensed or endorsed us to sell tickets, goods and or services in conjunction with their events.